It is important to have in mind the kind of surfaces and terrain you will be cycling on before you choose a bike. This can influence your decision in many ways. You will also need to think about the other road users you are come into contact with and how often you are likely to come into contact with them. For instance, there’s little point using an expensive road or racing bike to cycle to work when you are using a shared cycle route heavily frequented by other (slower?) cyclists and pedestrians. Let’s first start examining the different types of surfaces and how they affect your choice of bike. If you are going to be cycling exclusively on good quality roads then a road bike, touring or hybrid bike with <25mm section tyres is going to be a great choice. Lightweight rims and narrower light-weight tyres make for a more responsive bike. The reduced rolling resistance means the bike is more efficient when it comes to converting chemical energy from the food you eat into forward motion on the bike. Riding on lower quality or lesser maintained roads for anything but the shortest distances can be thoroughly miserable on a bike that’s not appropriate to them. Especially if they make up the most of your journey. If the road is still good enough such that you can avoid the areas where repairs are needed, then a road or racing bike is still a viable option – even if it means slowing down and taking a bit of extra car to avoid the potholes. Adding traffic to the mix, you need to look well ahead and ride assertively when necessary so that you are not force to ride through the nastiest of potholes which can damage your bike or worse result in you taking a spill. The same applies to wet man-hole covers. For more advice on cycling safely, take a look at Cyclecraft by John Franklin. It’s tempting to treat paths just the same as roads but there are some distinct differences to be aware of. Firstly though, it’s important to note this article is referring to cycle routes, cycle tracks and shared use cycle/pedestrian routes when discussing paths. Paths don’t benefit from the cleaning that roads get thanks to the larger wider wheels of motorized traffic passing over them. Thus they have a tendency to be covered in puncture inducing thorns or broken glass. It maybe beneficial to choose a bike that can take slightly wider tyres, perhaps a brand known for their puncture resistance such as Schwalbe Marathon. Another common ailment with paths is that they asphalt structure and thinner foundations means that they can get deeply rutted by shrub and tree roots. Finally, the last thing to touch on are the other users of cycle routes. Some routes prove to be popular with pedestrians, dog-walkers and other cyclists, all of whom may need care to negotiated, particularly on some narrower routes. All in all, if you intend to spend most of your time cycling on these types of routes, you are probably better of looking at a wider-tyred hybrid or touring bike. Cobbles can be fairly uncomfortable to ride on, and gravel can be hazardous. If you will be regularly riding on either of these types of surfaces, then I’d recommend the relaxed geometry of a touring bike as it will be much more stable. Possibly a hybrid, with medium section tyres or a mountain bike with front suspension and narrower semi-slick tyres. That said, there are cycle races such as Paris-Roubaix famed for their cobbles. It’s harsh on the riders and on the bikes – there’s no reason why you couldn’t tackle a similar route on a road racing bike if you want too. The key to cycling on Gravel is remaining lose and flexible on the bike. Relaxed handling and wider tyres can make for a more comfortable ride where as a road bike can be very twitchy. If you cycle sensibly and you can keep your upper body relaxed so you don’t find yourself gripping to tightly on the handle bars then you can ride a road bike safely on gravel. If you have longer gravel stretches to negotiate or you are an inexperienced or less confident rider, than a touring or mountain bike might be a better alternative. Mud have very different properties depending on whether it is dry or wet mud. Riding on dry mud, particularly on well smooth worn routes is feasible with practically any type of bike. Long stretches of wet mud can be more challenging. Smooth high pressure tyres will struggle to find traction. Depending on how wet and muddy the conditions are, then a touring bike or hybrid bike with slightly wider and lower pressure tyres may suffice. If we are talking about the kind of mud you could lose a shoe in, then we’re onto mountain bikes which afford two main benefits. Firstly you can choose tyres specifically designed to give most traction in muddy conditions and secondly, modern mountain bikes come more often than not equipped with disk brakes which are less susceptible to clogging up with mud as they are situated away from the rims, which will no doubt get buried in it. The truth is that many routes will take you over a variety of different surface types. Some of those surface types will be a mixture, for example mud and gravel. Generally the best advice is examine the types of surfaces that will make up the majority of your cycle rides – and then look at the extremes. Many experienced cyclists will actually keep more than one bike so that they are equipped to cycle in different conditions, but for many that’s not practical. Sometimes a compromise is needed – a mountain bike with semi-slick tyres for a person who likes to ride away from the road but isn’t necessarily a keen mountain cyclist, or a touring bike for someone who predominantly rides on the road but may on occasion need to tackle some farm tracks. The other factor on your side is that, if you are using a bike to get from A to B, there are many different routes from A to B. You may decide to exclusively cycle on roads – and many cyclists do because although it can sound counter-intuitive, it can be safer and more convenient than the alternatives. This is the last aspect we will be examining in terms where you intend to ride your potential new bicycle. Terrain generally fits into four broad categories – and considering this will help you decide on the range of gearing you need on your new bike. This applies to single and fixed gear bicycles too – although you will only have one gear, it’s important to ensure that the gear is appropriate for the area in which you are going to be cycling and also your level of fitness too. Unfortunately, when talking about bicycle gearing, it gets slightly complicated quite quickly. For the purposes of this article, we’re going to discuss it in vague terms. If you would like more detail, the Wikipedia article is quite useful. Folk tend to describe gears as low, medium and high. Low gears offer least resistance when pedalling, but the bike advances a very short distance for each pedal revolution. High gears offer the most resistance when pedalling, but the bike advances a much larger distance for each pedal revolution. Low gears are good for pedalling uphill – pacing yourself in a low gear will stop you getting too far out of breath. It’s also much better than “grinding” in medium or higher gears – turning the pedals slowly and straining against them. When you reach the summit and start going down hill, the chances are you can’t pedal that low gear quickly enough to increase the bikes propulsion. The temptation is actually to freewheel and let gravity do all the work. Which is fine, except on the descent your legs will cool down and as you have stopped pedalling, slowing down your circulation, you will allow lactic acid to build up in your leg muscles. It’s much better and less tiring over a longer journey to change to a higher gear so that you start to feel just a small amount of resistance to the pedals and continue pedalling down hill. Remember that it is better to pedal smoothly in a lower gear at a higher speed (usually 80 to 90 revolutions per second) than it is to grind slowly in high gears. Cycling shoes with cleats that fit into “clipless pedals” effectively attaching the rider to the bike can make it easier to pedal smoothly and more efficiently, although that is getting more in-depth and probably suited to an article by itself. 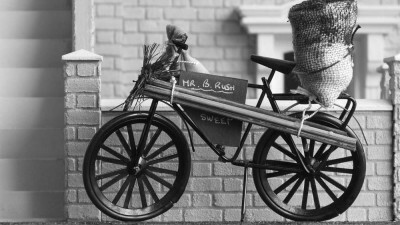 A model of a Victorian era Chimney Sweep’s bike. Cycling has evolved into a class-less mode of transport. This is probably the most common type of terrain in most areas in the UK. Gentle inclines that mean you are always cycling either slightly up or down hill. Again, for most cyclists a bike with a smaller number of gears will be sufficient. That usually means a single chainring – that’s the large toothed wheel connected to the bike’s right-hand pedal via the right-hand crank. A twin chain ring will give a wider range of gears, and a triple chain ring will give still a wider range. The small cogs attached to the rear wheel are called cogs. A set of cogs is often called a cassette. This of course applies to bikes that have dérailleur gears. Some bikes have hub gears that are completely internal to the back wheels hub with just a shift cable that leads into it. The number of gears on a bike with dérailleur gears is equal to the number of cogs on the cassette multiplied by the number of chain rings. Thus a bike with a single chainring and a cassette with 6 cogs has 6 gears. A bike with a twin chainring and 7 cogs has 14 gears. It isn’t uncommon to see bikes with cassettes that have 8, 9 or even 10 sprockets these days. They usually have a similar range of gears, but with smaller increments between them, particularly the lower gears. This allows riders to spin at their perfect cadence and is inspired mainly from cycle racing where this far more important. Hilly terrain can be much more challenging than cycling on flat or undulating terrain, although cycling all day into a headwind without the respite offered by an occasional hill is not to be sniffed at. Tackling hills is much easier on a bike that fits you well and is well maintained. Any inefficiencies are felt most when you are climbing. It’s important to pace yourself, even if that means riding in your lowest gears. Over time, your fitness will improve and you will climb faster. Lots of experience cyclists enjoy the challenge and accomplishment of riding over hills. With hilly terrain, a bike with a triple chainset can be a real boon. Using the smallest chainring combined with the largest sprockets on the rear of the bike will give you the lowest gear. On some bikes this is slower than a good walking pace, which makes climbing most hills in most circumstances much easier, albeit slower. Mountainous terrain is like hilly terrain on steroids. It means either steep, long or steep and long climbs which can push riders to the extremes of physical exertion. I would not discourage anyone who wanted to try their hand at tackling some serious hills – I’ve seen enough people as adults take up cycling and then within a year cycle the full Tour de France route, including L’Alpe d’Huez. It’s important to consider a feat like this will involve getting some serious time in the saddle before hand, but completing it will make for an incredible sense of achievement. That’s before mentioning how the additional fitness will improve your own lifestyle, especially if you are cycle commuting too and not dependant on a cup of coffee to get going when you arrive at work. Finally then, we explore the last of the three questions in relation to choosing the right bike before wrapping up with some final wisdom.